Born and raised in Chester County, Edward M. Foley graduated from Penn State University as a mathematics major. He attended law school at the University of North Carolina – Chapel Hill and was also a visiting student at the University of Pennsylvania School of Law. After receiving his law degree, Ed was admitted to the Pennsylvania bar in 1978. He has been admitted to practice before the U.S. District Court (Eastern District of Pennsylvania) and the U.S. Circuit Court of Appeals (Third Circuit), and is also a member of the Chester County and Pennsylvania Bar Associations. After practicing in Delaware County for four years, Ed joined the Brutscher firm in 1982, and was named partner in 1985. Since then, the firm has continued to grow and now consists of five attorneys, practicing as Brutscher, Foley, Milliner, Land & Kelly, LLP. Ed’s areas of practice include estate planning and administration; real estate, land development, zoning and subdivision; formation of business entities; and personal injury and workers’ compensation litigation. 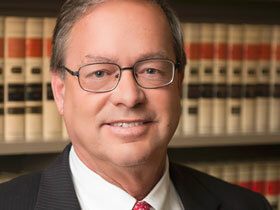 He represents zoning hearing boards in the Southern Chester County, and is a member of The Million Dollar Advocates Forum, an association of trial lawyers who have successfully litigated million dollar or multi-million dollar claims. A long-standing member of the Kennett Area YMCA, Ed has served on its Board of Directors, as well as on the Board of the United Way, of which he is also a past president. Ed and his wife, Donna, reside in Kennett Square, Pennsylvania. They are active in their church and enjoy hiking, biking and kayaking. A runner in high school and college, Ed can be found annually at The Kennett Run and other local 5K events, where he is striving to remain competitive in his age group. Since 1950, the Brutscher firm has served clients in Chester County and the surrounding area in all areas of the law. With representative clients from all business endeavors and walks of life, the firm prides itself on being true representatives of the community.